(Newser) – The US women's soccer team was eliminated by Sweden in the quarterfinal at the Rio Olympic Games on Friday, the AP reports. The match was a stunning loss for the US team, which has played in the final every year since women's soccer became an Olympic sport in 1996, winning gold four times. The match went to penalty kicks after a 1-1 draw following extra time. 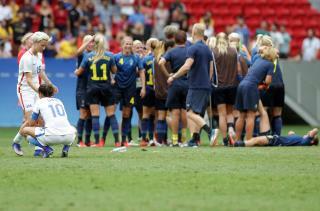 It was the first Olympic women's match to go to penalties.